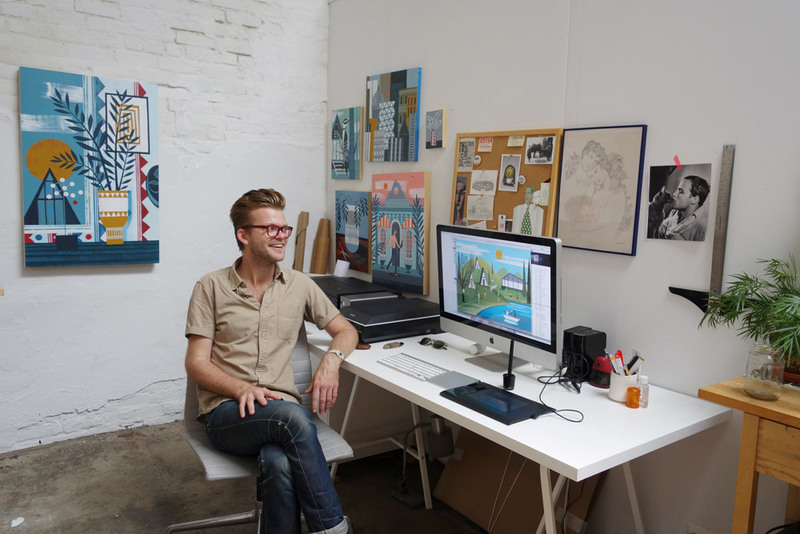 We’d like you to meet Sam Kalda, a Brooklyn based illustrator and cat fancier. Design and illustration is his way of thinking, which pushes his artful life. What’s the major difference between design and illustration to you? How do they inform one another in your work? Design is more of a way of thinking and illustration is a visualization of a concept or narrative. I’m constantly thinking about design when creating illustrations. 1) My collection of art and design books. They’re both beautiful to look at and a hugely valuable creative resource. 2) Eames office chair. I’d been obsessed with getting one for years. It’s kind of my baby. 3) Poster of Saul Steinberg’s “View of the World from 9th Avenue.” I bought it at a vintage store in Queens for about $15. You have done editorial work for The New York Times and The Wall Street Journal among many others. How do you approach illustrating sometimes abstract, hard to visualize concepts? I usually panic first. Then, I read the article several times, highlighting words or quotes that are evocative. From there, I write down lists of word associations. After that, I start roughing out the visual concepts. Once I’m clear on a direction, I do research and create mood boards if time permits. The power of sharing through social media is all around us and constantly grows. How have you found the power of sharing to be an effect on your work, either for the positive or negative? I think it’s a great way to let people see your process. In many ways, I see my Instagram account as an extension of my sketchbook. It can be a great sounding board to see what your viewers respond to. That being said, it can easily become a serious time waster in the studio. When do you think you really found your illustration niche? I still feel like I’m constantly discovering new ways of working. However, I was freelancing for about two years when I really started to settle on a style. I wake up, check emails, drink coffee and read for about an hour. Then I get to the studio between 9 and 10am. At that point, my schedule is dictated by deadlines. If I’m free schedule-wise, I work on paintings or work on some ideas for other projects. Most inspirational quote you’ve heard? A painting professor once told me, “You have to make work for yourself before you can make it for anyone else.” I really believe that.